If you haven't begun a daily read aloud routine with your baby, I think 9 months is a great time to start. Generally, the baby is on a fairly regular schedule by that age. The family is back on a routine or schedule. And the baby is so eager to interact with you, that reading time will feel very rewarding to a parent. This week I wanted to share some of the books that I am reading with Tyson, my 9 month old. Tyson (9 months) and Logan (2 years) love this book. Tyson loves when I sing to him and he loves the actions of making his arms go round and round, with help. Both boys love when the babies say, "waa, waa, waa." I think Tyson may even be tentively trying out the word baby as he always babbles, "ba-ba-ba." on that verse (or he is just babbling and that's ok too.) And he babbles, "ma-ma" when the mommies on the bus say "shh, shh, shh." The text actually says "parents" but I always forget and say "mommies". If you don't have this book, you can always just sing the song to your baby as it is familiar. But we really love this particular version because of the wonderful illustrations. They are humorous and detailed enough that you can have a conversation with your older child, yet your baby can still take in the illustrations without the page being overly busy. Polar Bear, Polar Bear What do you Hear? by Bill Martin Jr. This book is similar to the classic "Brown Bear, Brown Bear What do you See?" except it focuses on animal sounds.. What I like about this book is that it discusses a variety of animal sounds including some that would not be found in a typical book on animal sounds (such as zebras, peacocks, and walruses). We have the board book version and so Tyson is working on learning to turn the pages in the book. He also likes to bat at the animals and sometimes even points to them. Moo, Baa, La, la, la by Sandra Boynton is another book that is good for sharing with children of multiple ages. Logan finds the three singing pigs say, "la, la, la." funny still. And Tyson likes to look at the cartoon animals. It is another fun book for teaching animal sounds and pointing. Do you notice a theme here? Since Tyson has decided he loves to point, I decided a word book was in order. Generally, I like to stick with books that have very clear illustrations for babies (like the Bill Martin animal books that only have one large animal per page). But by 9 months, a babies visual perception is probably good enough to start introducing word books. I love this book because it involves every day people (mommy, daddy, boy, baby, etc.) and every day places (home, school, grocery store, playground). Again, this is a good book for reading to children of a variety of ages.Tyson loves to bat at the pictures and point. Logan loves to make up a story about the pictures.. An older child who was a beginning reader could try to read the labels on the pages for sight word practice. Even with a young baby, you can begin making connections in text by showing the baby a page with the playground and saying, "remember when we went to the playground? Remember when you went down the slide? whoosh. That was fun!" 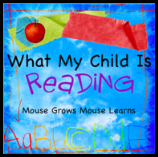 I'm linking this up to What My Child is Reading at Mouse Learns, Mouse Grows. Check it out to see book suggestions for all ages. Oh these are great picks. Have fond memories from not-so-long-ago...my now 4-year-old likes to revisit some of her baby favorites every now and then. Like 10 little Kisses, Daddy and Me, Goodnight Moon, The Runaway Bunny...never gets bored reading some of 'em over and over again! I absolutely agree - getting into reading routine so important. I still remember little baby Anna cuddling with me looking at the books and trying to lift the pictures off the pages. This time is so fleeting, but so crucial. Great book picks for this post, and thank you for joining WMCIR!